Work between the palms of the hands and apply to towel-dried or dry hair for hold and texture. Bedhead Tigi B For Men Pure Texture Molding Paste adds texture and hold the male hair. 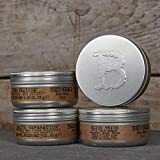 Formulated to create stunning textures, B For Men Pure Texture Molding Paste B For Men is enriched with wax caranauba that helps moisturize the hair while providing flexibility.